What’s the staple food in West Bengal? Any guesses? If you answered fish, you’re suffering from a common misconception (another link). Fish is the most loved dish. But Bhaat (i.e. steamed rice, boiled rice or ubla chawal) is something that Bongs drool over. The Bengal region includes the largest delta (Ganga Brahmaputra delta) in the world and the loamy soil of this delta has favored the cultivation on rice. So, boiled rice has become the staple food, and the main source of carbohydrate among the people of this region. Useful Tip: Don’t ask a Bengali “did you have lunch?” Ask “Bhaat kheycho?”(“Did you have rice?”). The Bong guy will suddenly feel connected to you. Bangalir Bhaat ghum is proverbial – a Bengali usually dozes off post lunch, location notwithstanding. Rice is usually accompanied with some lentils and any kind of fry, potato, aubergine (brinjal, baingan, baigan), or any other vegetable. A platter of bhaat, dal and bhaaja (rice, lentils and fries) is one of the leanest, and thus, cheapest meal. Lentil is prepared in several ways. The most preferred one is masur dal (also, musur dal, masoor dal, musuri dal, red lentil). Predictably, the spices used vary with the style of cooking musuri dal. My last two posts were on desserts (give links), thought of writing a simple and lean platter for today’s post. As they say in Bangalore, Enjoy Madi! Hot Tips – While cooking the dal, you can also do it in a pressure cooker, allow two whistles before you take it out of flame. I had uchche diye mug daal with byashon+chaler gNuro diye kumro and alu bhaja for dinner with Rajasthai lime pickle on the side…it was heavenly. 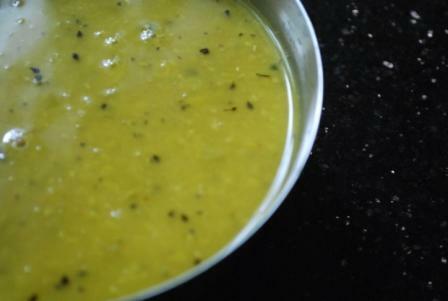 I have yet to try daal made with mustard oil………and I will! looks really good to pass up. Daal-Bhaat…comfort in a bowl indeed. Its really the best way to relax for the cook as well as the person having it. :). No spice, a very light meal and not much hassle to prepare it. This is the first time I visited your blog. I’m someone who’s least interested in cooking and have rarely been to my kitchen. But now, I’m about to get married to a Bengali and we both love to eat….and he will surely never cook. I believe, from now on i will be a regular visitor at your blog….and will get to learn alot…the bhaat dal and bhaaja is i guess the easiest and most convenient dish to start with…. I will surely try it before i get married and write in to you. Wish you all the luck for a very happy married life. Please subscribe to the feed of our blog, and you’ll be able to get the posts delivered to your inbox. Do let me know if you require any help in the kitchen :). For months I have been searching for good traditional Bengali foods and it was today I found your site!! Keep up the excellent work. My mother sadly never taught me how to cook these basic dishes. Its wonderful to find recipes that are not only delicious but traditional!! Thank you so much for your encouraging comment. I am happy that you liked the site. Please subscribe to the feed to get the posts sent to your reader. i had visited your blog long time back, i guess the blog design was different then. suddenly i got this link from my bookmark…and visiting again !! thankfully i had bookmarked this 🙂 this is such a nice blog, with mouthwatering dishes…dekhei mone hoche shob kichu ranna kore feli !! 😀 shob bangalir moton amaro priyo dal bhaat ar bhaja, splly potol bhaja, jeta ekhane ekebarei paina 🙁 and hope to try misti doi soon. yougurt ta deoar aage ki beat kore nite hobe ?? thanks for sharing . i cudnt find your profile/name btw … !! .-= Tulip´s last blog ..Vegetable Stir-Fry =-. Looks like ultimate comfort food! .-= Divya Vikram´s last blog ..Vegetable jalfrezie dec 15th =-. Bengali’ s favourite one……..and My fav one too… a simple and tasty combination of Bengali meal……..Thanks for sharing……. Heard there was an earthquake over there.hope you are all well. .-= Kathy Gori´s last blog ..Hooked On Clay! : An Afterschool Special =-. comfort meal at its best! .-= mandira´s last blog ..Fresh Cherry Tomatoes =-. Looks absolutely lovely. Your site will be a great resource when I try my hand at some of the beautiful Bengali recipes I have tucked away! .-= Megan@Feasting on Art´s last blog ..Botero’s Frozen Watermelon Margarita =-. Thanks a lot for your comment. Please do let me know what you prepared. tumi kamon sahoj kore sajiyecho ei blog! dekhe amar mon bhore tai kori ei jogajog!!! .-= Indira Mukerjee´s last blog ..বাড়ি বদল =-. Ae sundor kabitatar janne bishan bishan dhannobad :). Ami chesta korbo paurer kono post e tomar ae comment ta include korte, asha kori tumi seta kichu mind korbe na :). .-= Navita´s last blog ..No-Bake Mirrored Mango Cheese Cake (eggless) …with the goodness of Goji Berries. =-. it looks superb!! and also new to me..never tried with masoor dal :)have to buy once..
.-= chitra´s last blog ..VARUTHU ARAICHA VATHAKUZHAMBU =-.